After all the terror in Paris – fashion returns to the catwalk with the fall shows! After all of the horror of the last couple of weeks in France there was a sense of normalcy that returned to the capital Paris with the start of Fashion Week, showing the latest Fall fashions. It was nice to see the city attempt to begin moving on and return to some sense of life moving on, even after all of the tragedy! 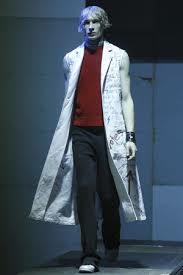 An to the shows and one of the first ranges to be shown is the new Fall menswear range from Raf Simons and what a triumph it was! This collection was all about length, knits, deconstructed edges to the long jackets and flashes of colour that all added to a strong, masculine story that also had some gender neutral pieces and it is nice to see the length of some shirts, t-shirts and knits continue the longer trend. Of course from a European perspective this makes so much sense as it keeps the warmth in and covers you up more…for us here in Perth it will just be about the look more than keeping us warm as we don’t get all the extremes in temperature. In the 41 looks, edges were often frayed on long, voluminous column silhouettes in gray and blue, broken up with flashes of crimson and canary yellow. Flappy beige trench coats had sleeves torn off. White chemistry-class aprons featured hand-drawn doodles. And hair was made to look like it was styled by a greasy and rebellious adolescent. There was bold blocking for jackets, sleeveless jackets that almost touched the ground, strong colours in pants and hounds tooth in a variety of new shades to round out the collection. 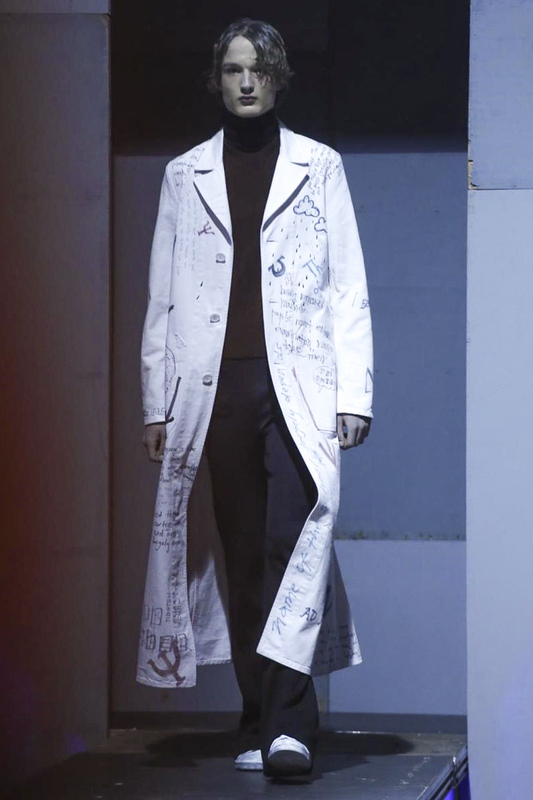 I especially loved the large oversized overcoat in white, that almost look like a factory foreman’s coat except for all of the printed writing on it. This gave the jacket an almost graffiti feel about it and teamed with the turtle neck and the knit was just spot on. The coat was also presented without the sleeves and was paired with a stunning red sleeveless vest and a checked turtle neck that added another level to this look. 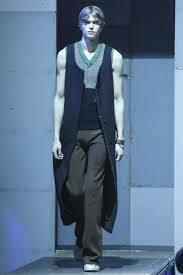 The cut out sleeveless long jackets were also stand out items in this range for me. They looked almost like they were patterns with their frayed edging and simple style. They hung well on the models and were presented in a range of fabrics and colours across the range with a focus on more muted autumnal colors showing through here. There were also strong vibrant reds, mustards, yellows and blues represented to lift some of the looks and add yet another dimension to the collection. Included as well were very simple knits that stood our for their simplicity in design. 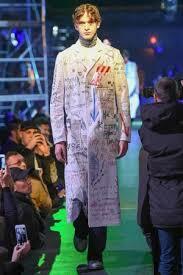 This was a bold, fresh look for Raf Simons and one that is sure to be very popular in the market place! To entertain at home or meet at a restaurant for a meal – a first world modern dilemna! Autumn Menswear from Milan 2015!